If you are looking for a Malaysia souvenir to purchase, you will soon find that there are many of these items that are on sale at various shopping complexes and crafts centre. A brief description of some of the items made by the local craftsmen of Malaysia is provided below. Batik is the local language which means "to draw in wax" and its origin can be traced back to Indonesia. There are 2 types of batik production namely "Tulis or Conteng" and "Cap". The first method uses a metal pen tool filled with hot wax in outlining the design of the batik. After the outline has been drawn, colours are painted on the cloth. "Tulis" means write and "conteng" means scribble in the local language. The "Cap" method uses the application of wax directly onto the cloth using soldered tin or copper strips block impressed with the fashioned design. The newer process using silkscreen is commonly used now where different screens are used according to the colours and patterns desired. Traditional batik uses silk or cotton cloth as its material. The advancement of technology has enabled fabrics such as voile, chiffon, cheesecloth, georgette and velvet to be used in the design of batik. The songket is an elaborate and richly hued handwoven embroidery used by the Malays Royalty and nobility. Infused with traditional handwoven silk or cotton yarn, it is a colourful cloth which is still used today during the coronation of a King or Sultan, weddings or awards ceremony. Bow ties, vests and jackets can also be made from this material. Pewter was made popular in Malaysia as Malaysia was a leading tin mining nation in the late 19th century to early 20th century. Pewter is made from an alloy composed of tin and other metals of which the molten metal is poured into pre heated steel mould, filed and polished. More complicated item consists of different parts which are soldered together. Some of the souvenir items made from pewter are mug, name card holder, twin tower, kl tower, photo frame, cigarette lighter, letter opener and clock. Visit Royal Selangor Visitor Centre in Setapak and you will learn the art of making pewter as well as making your own souvenir. In the past, silverware was linked to the social status of a person. It signifies wealth and power during the time of the Malay aristocracy in the Malacca Sutanate. It is made by hammering the silver and decorated with patterns of flora and fauna motifs. Two categories of silver crafting are used in Malaysia. The first method is filigree work where the silver is drawn into fine threads and twisted into delicate ornamental tracery. The second method is repousse where sheet silver is hammered into relief from the reverse to produce various designs for the items being made. The items that are produced are silver rose bowls, jewellery boxes, bolster ends, the caping, belts, buckles, snuff boxes, and betelnut set. Betelnut set is also called "Tepak Sireh" in Malay language usually used by the Malays. It is the custom of the Malay suitor to announce his intentions to his prospective bride's parents by sending them a complete set of betelnut through a trusted intermediary. The acceptance of the gift signifies agreement to the betrothal. The forest based fibres such as rattan bamboo, ribu-ribu, bemban, mengkuang and pandanus are coiled, plaited, twined and woven to produce comely bags, baskets, mats and hats. Rattan or cane are usually used for furniture while the smaller varieties are woven into baskets ranging from waste paper basket to picnic hampers. The ribu-ribu of Sabah or Lygodium are woven from the twines of the creeper fern by the ethnic Rungus people in Kudat and is a Sabah specialty. So, remember to get one if you happen to be in Sabah. Ceramic and glass craft are also widely produced in Malaysia as souvenir items. The abundance of good and durable tropical wood from the rainforests of Malaysia has enabled the woodcarvings industry to thrive. Head for WARISENI Woodcarvings at the capital city of Kuala Lumpur and see the many products on display here. You may even want to purchase an item or two as a Malaysia souvenir. If you are in the capital of Malaysia, head for Kuala Lumpur Craft Complex to see the souvenir items that are readily available for you to choose from. You can also go to Central Market, one of the most popular tourist destination in getting souvenirs from Malaysia. 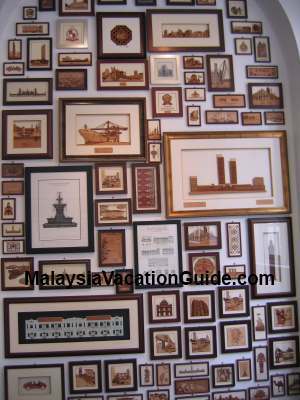 Get a listing of Kuala Lumpur Souvenir Outlets to help you get good and value for money souvenirs. Pucuk Rebung Museum Gallery in Suria KLCC is another place you can go for some unique souvenir and collectibles. If you are into stamps, you may want to visit the head office of Pos Malaysia where you can purchase stamps of Malaysia.